Returning home from holidays is not easy. In some sense, I’d like to call it a holiday hangover. You start walking on the wrong side of the road, sleeping at odd hours, and in perpetual need of energy to unpack everything and resume life “at home” as usual. Part of that was getting all of my HF-gear back up and running so I could enjoy the airwaves for a bit. The ICOM IC-R75 is a receiver I hold dear – it was an expensive purchase for me as an undergraduate uni student back in 2010, but it was an investment I was prepared to make as I decided that I wanted to do some shortwave listening, utility monitoring and amateur-radio monitoring. I bought an ICOM IC-R20 just a few years prior, and it proved to be another expensive but good buy, as it got me into amateur radio satellites and scanning the analog transmissions (which are sadly, drying up). While the IC-R75 I have is not one of the prized earlier models with the S-AM capability, nor one retrofitted by Kiwa to actually make it work, it was one that has travelled with me between houses and received a host of upgrades including the DSP board (meh), two IF filters (useful) and a high stability ovenized crystal oscillator (very useful). Interestingly, it is one of ICOM’s success stories, being introduced in 1999 and only just being discontinued in 2016 (or so they say). SDR has finally come of age, and their new standalone table-top receivers are SDR based (such as the IC-R8600), with advanced features but also … an advanced price tag. Not long after getting the IC-R75, I did get my Winradio Excalibur G31DDC which became my primary unit, but the R75 still had lots of “work” to do, as it was still a bit more sensitive. Imagine my dismay when I couldn’t get the thing to power up after getting it all plugged in. I suspected the power plug to be the issue. It uses a barrel plug and surprisingly, there was lots of corrosion or dirt on the barrel. I gave it a good wipe down and rub, and it became shiny as new. I plugged it back in, still no dice. Then I realized that the tongue of the connector on the radio had a lot of white fluffy corrosion on it too. As a result, I got a jeweller’s flat-blade screw driver and scratched most of it off, and polished it with a fine fragment of wet-and-dry sandpaper. Plugging it in gave an occasional click of the relay, but the unit still didn’t power up consistently. When it did, it sometimes reset on a loud audio transient, and then eventually it stopped working again. Because there was some play in the connector on the board, I feared the worst, and decided that the jack might have a broken connection to the board somewhere. As no stranger to servicing the inside of the radio, I opened it up only to find that the jack is encased from all sides even with the outside covers removed. There was no shortcuts to getting the board out. Instead, all the screws would have to come out, all the flexible flat cables and coaxial jumpers. The UT-106 lead would have to come out too, noting one end is soldered to the mainboard, and two clips to transistor/regulator packages that use the side of the radio as a heatsink. After undoing all of it and taking the mainboard out, guess what? The solder joints were absolutely pristine and intact, and the slight play in the plug was bending of the legs of the plug. That wasn’t good, but it was no fault found here. Reluctantly, I reassembled the unit, and replaced the CR2032 coin cell which was down to just 0.6V now. 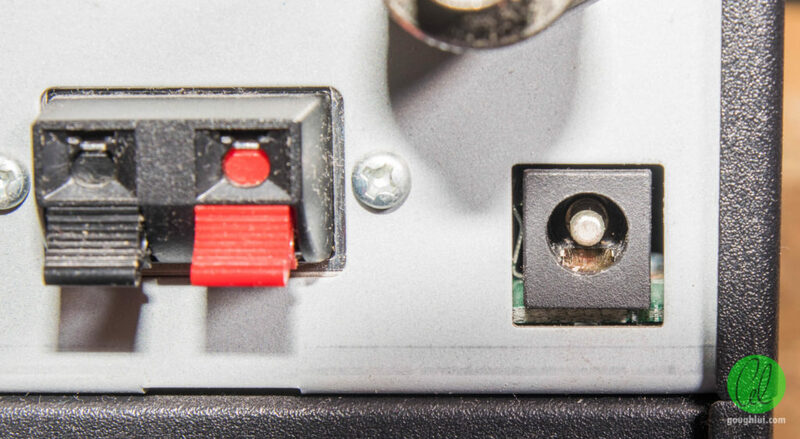 The fault, as it turns out, was related to the two “springy” contacts that make contact with the centre post in the connector. Some plastic had worn off from the connector, and collected over time on the leading edges. The metal also seemingly had fatigued somewhat, so the centre connection wasn’t reliably being made. Scratching off the dirt and blowing it out helped, but bending the side pins back towards the middle to give it a little more tension finally fixed the problem. The metal will probably fatigue in due time, in which case, replacing the connector is probably the best solution. At least, I’m back monitoring the air! Sometimes some problems are really simple ones … and to convince yourself otherwise is going to lead you to do a lot of unnecessary work. At least it’s back up and running … and opening it up wasn’t entirely worthless since I did replace the CR2032 for the onboard RTC. But who would’ve guessed that my first guess was so close to the problem – it was the plug after all. This entry was posted in Electronics, Radio and tagged electronics, radio, repair, rf. Bookmark the permalink.